Have they tried strategies with him? 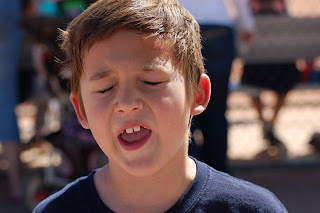 I have a few students who massage their jaw (looks more like they're holding their head in their hand), use their fingers to tap syllables to slow them down, and talk in rhythm (which is difficult, but effective). Also, there's this hearing aid-type thing called a speakeasy that echos his speech in his ear to reduce stuttering. I'm not sure if insurance covers that or not. Please keep me updated, I'd be happy to help as much as I can. How old is he? If he is at least 12, then Hollins Communications Research Institute would be a good thing for him. I used to stutter terribly, and it really was a whole body thing. The throat gets tight and tense and you blink and strain and get winded and in the end all you have is frustration. Hollins has a 12-day program and they guarantee fluency at the end of it. I attended it 3 years ago and I have not stuttered since. This is the site. http://www.stuttering.org/ You might just check it out and see some of their before/after videos and read their statistics of people who have gone. It convinced me to go and it has been life-changing. I might just add that if Nate is not ready to give his whole self to overcoming stuttering, then it might not work for him. There was one kid in my session who thought the program was stupid, and he didn't want to work at it, so he still stuttered by the end. I would highly recommend this to anyone who stuttered and I've been looking for stutterers ever since I went though the program myself. Correction, you have to be 11.